Dillian Whyte (16-0, 13ko) has questioned bitter rival Anthony Joshua’s (14-0, 14ko) mental strength ahead of their much-hyped, grudge British and Commonwealth heavyweight title clash on Saturday night, saying that he feels the gold medal winning Olympian is too heavily reliant on his promotional ‘hype-machine’ and myriad elite resources, stating mentally, the man he calls ‘Fake-J’ is feeling the heat inside. The two will step between the ropes on Saturday night, 6 long years after their 2009 amateur encounter that saw Joshua knocked down and defeated on points, and Whyte, while being a considerable betting underdog for this fight, is supremely confident that he has the tools to defeat his big-hitting rival in the pros, using skills honed over recent months under former Emanuel Steward charge, Johnathon Banks. “It was a good episode but Sky and Matchroom are playing games. It was cut so much, at least 20-30 mins, it was cut to pieces, there was so much you didn’t see,” Whyte exclusively told EastsideBoxing. “But hey, they want to make the ‘Golden Boy’ look a certain way. It’s cool. I know he is a liar and a fraud. Joshua appeared to remain mostly unflappable in the episode, and a picture of serene, professional calm, a demeanor Whyte says is all part of an image cultivated purely by the set-up around him. 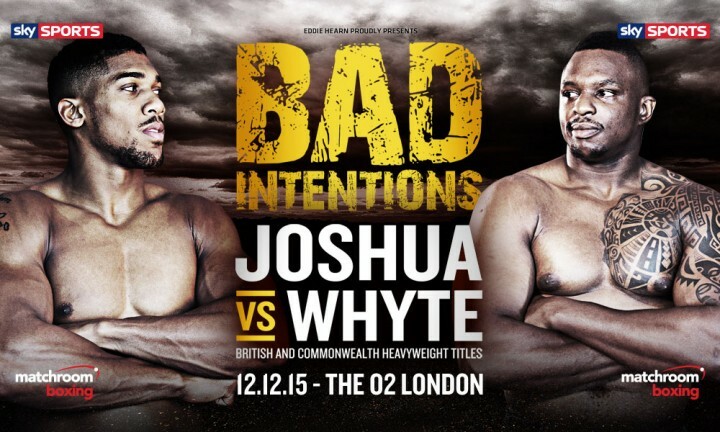 Sitting and looking Whyte in the eye, Joshua promises he will make ‘easy work’ of him. “That’s just all his sports psychiatry [sic] telling him ‘say this’ or ‘say that!,” Whyte laughed. “That’s just the people around him saying it because they know he’s insecure! How can he say that? He must be drunk! It’s just talk. I’m not light work for no one in the heavyweight division. Whyte is also under no illusions that he is the ‘away’ fighter against the hugely popular Joshua, even in his home city, and claims he has been unaffected by all the behind-the-scenes mind games and unsettling tactics that go with being in such a position. Whyte has also been tipped to win the fight by WBC heavyweight champon, Deontay Wilder, and while accepting and mildy flattered by the praise, he says he and Banks have planned their game plan precisely out at the Klitschko training base in Austria, and other opinions – of fighters or fans – are of no real consequence. “We are going up a level fighting somebody who is just as ambitious as I am…. supposedly,” Whyte said. “I will box smart, take it easy and see how he responds to the shots I’m gonna hit him with, and see what happens. “But you know me, I’m one of them fighters that always wants to be involved in the KO in big fights. I wanna be remembered like guys like Nigel Benn, Mike Tyson, you know, good fights the fans talk about years after I’m gone. That’s the reputation I want to leave after I leave boxing. “If [Joshua] gets blown out by me in a round or two, of which there is a very high possibility, what is he gonna do? Next boxing news: If it wasn’t Jacobs’ luck, was it Quillin’s bad luck?